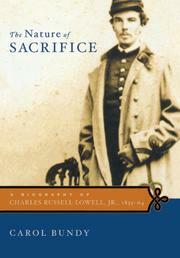 A Biography of Charles Russell Lowell, Jr.
A stunning biography of a young man from one of American’s most celebrated families who quickly rose to the rank of colonel in the Union cavalry and died, at age 29, from wounds suffered in a charge at Cedar Creek. At the funeral of Charles Russell Lowell (1835–64), nephew of poet James Russell Lowell, were some of the greatest names in American letters: Longfellow, Emerson, Holmes (the cast of The Dante Club!). Hawthorne would have been there, too, had he not died himself a few months earlier. Bundy has examined an abundance of evidence in her reconstruction of the life of this most remarkable fellow—family letters and diaries, published histories of the Civil War (and of its individual encounters), biographies of key figures in the story. She begins with Lowell’s death, then retreats to examine his ancestry (on numerous branches of the family tree, a copy of which would have been helpful), and then relates the short, mostly happy life of her principal. Lowell did well in school (winning top honors at both Boston Latin and Harvard) but then, like many other young men, spun his wheels before finding traction in his military career. Before the Civil War, he worked for a merchant, tried the iron business, got involved in a grain deal. Then, in the mid-1850s, he showed signs of tuberculosis. Fortunately, however, the disease went into partial remission, enabling him to live a very active life—including a lengthy tour of the Continent (he visited Italian museums with Hawthorne) and a successful stint in the railroad business in Iowa. Once the Civil War began, Lowell and many of his Harvard coevals enlisted to fight (most would be wounded or killed), and he discovered his talents for leadership. His cavalry unit chased the notorious Mosby, won some impressive encounters, earned the respect of the military brass. When Lowell died, Custer wept.